Rock Paper Lizard: Richmond snow goosery and schoolyardivory, 2012. Richmond snow goosery and schoolyardivory, 2012. Pin colours explained in the bold text below. 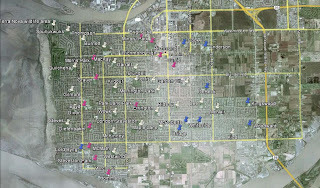 Over the past few days, my son and I have been visiting schoolyards throughout Richmond BC, determining how many have been grazed by snow geese this winter, and to what extent. Richmond is conveniently pre-planned for such a study, a pancake of land with a grid-pattern of major roads spaced a quarter-mile apart, which I enjoy (the city pre-dates Canada's adoption of the dull oppressiveness of the metric system). Within almost every quarter-mile square there is a green space containing a schoolyard, almost always surrounded by continua of cedar fences that mark the backyards of houses. It would be difficult to design a more snow goose behaviour study-friendly urban landscape. We were wondering which schoolyards the geese prefer, and why. Are they the ones closest to the western foreshore, the historical foraging habitat, or the largest, most humongous flock-accommodating ones, or the wettest ones, or the something-elsiest ones? Well, the more schoolyards we have checked, the more it seems that they like all of them, but they do a lot more damage to some than to others for reasons not very well understood. On the map above, a white pin indicates that snow geese have visited and left signs of their presence at a given school. 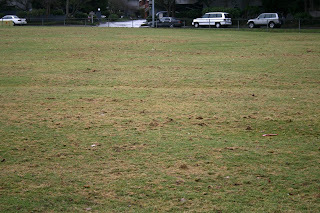 Signs of presence include droppings, slightly disturbed turf, moderately disturbed turf, or really, really disturbed turf. Blue pins indicate no discernible sign of goose presence. Pink pins are schoolyards that have not been inspected. Short account of results: They really aren't picky. Large or small, any schoolyard on the west side of the city has been pillaged to some extent. During November-February, flocks of geese have wandered all over the western island, feasting on schoolyards. 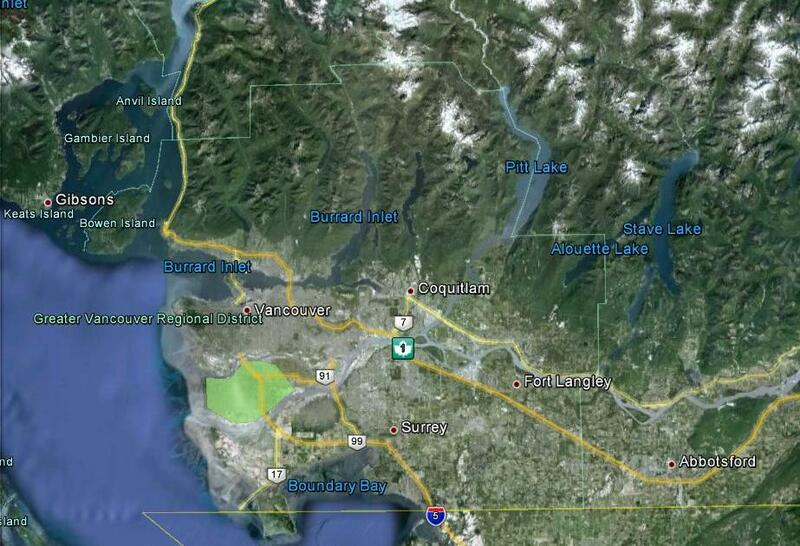 If you are wondering where Richmond is, it is (in part) the lime-green blob in the above image. Vancouver is to the north, and Delta BC is to the south. The yellow horizontal line near the bottom of the image is the Canada-US border. Here's an example of lightly-moderately disturbed turf (McKay Elementary School). This is, so far, the most damaged schoolyard observed (Walter Lee Elementary). This seems odd, because it is four miles inland, and the nearest school, 400 metres away, is untouched. Oh, in a recent post, I mused that the geese might have had headed south to Washington State, were no longer around. It is safe to say, "WRONG!" Here's a gang of about 2,000 on February 12, ravaging the field at McKinney Elementary. 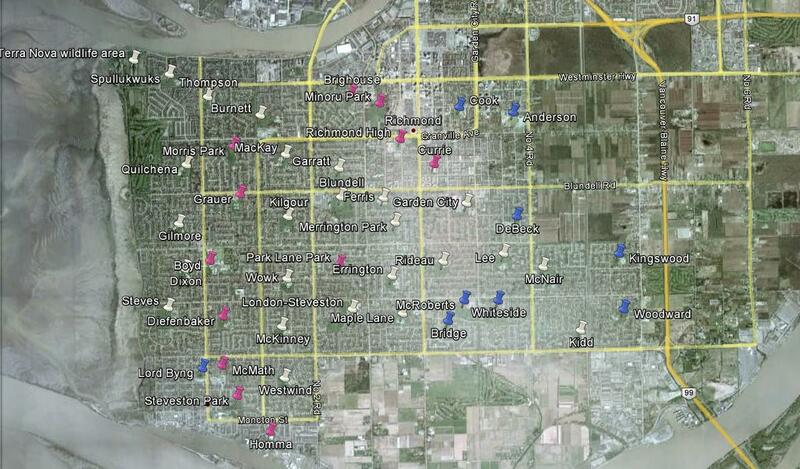 Update: Here is a more detailed report of the activities of snow geese in Richmond, 2012. By chance, is your son of the age where they do science fair projects? Here in the US it starts at 7th grade. Curious as to why snow geese particularly like the Walter Lee. I imagine school yards with their fenced in areas are favorable, because there are no dogs or predators around. Yes, that age. Almost all the schoolyards are fenced on at least three sides, often with the school forming a fourth wall. 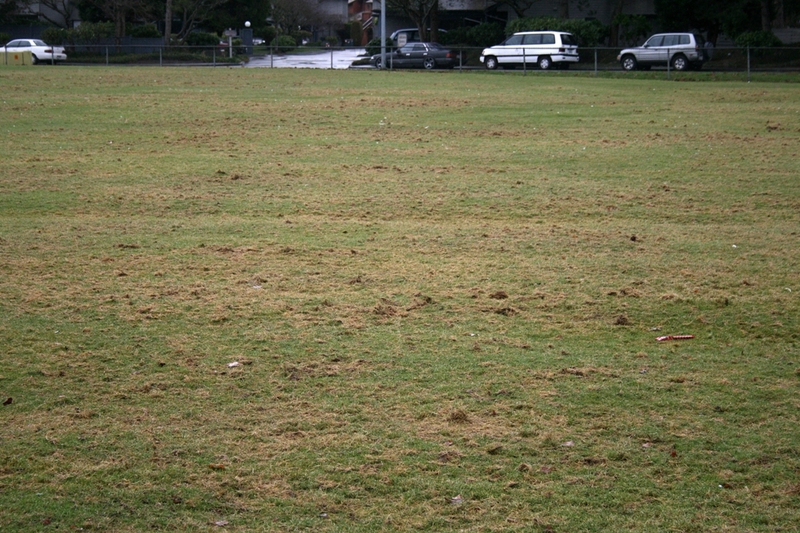 It seems that the main attractor is standing water on the turf, which approximates the intertidal marsh lands where they would otherwise forage. Sounds like a cool project for kids at these schools to study or talk about! It would be interesting also to note where the snow geese acted alone and where the damage was exacerbated by the gulls. I know the past couple of mornings there have been hundreds of gulls on the field west of Thompson CC. "During November-February, flocks of geese have wandered all over the western island, feasting on schoolyards." Feasting on schoolyards? Or feasting on children in schoolyards? Eskarina, I don't know what effect the gulls have. They seem to be attracted to the areas the geese rip up (and they really do rip it). I assume they're poking in the mud after worms. Heidi, The children and geese have an uneasy truce. The children have weapons (4-square balls) and the geese deposit minefields wherever they can. Kim, I hope there's a neat project here with answers other than, simply, "They eat any field, anywhere." All but one of the blue pins are east of the N/S road which runs through the center of your town (through the point labeled Richmond with a dot). Using a Chi-square applet, I get a Chi-statistic of 10.93, p value 9.42*10^-4. The proportions are different. (Fisher's exact gives a two-tailed p of .00153, and is a better test because the N_cell qtys are so small, but I've never seen anything but Chi-square taught in HS and below science classes.) There is a difference between the two proportions. You might also want to measure the E/W straight line distance between the high water mark on the coast, and each school. Get an average for attacked vs unattacked and do a t-test. It might come out statistically significant. Anon, Thank you for your help and advice. I'm not sure what stats are expected for the grade level (pre HS), but as long as the students have some understanding of what they mean, they should be included. We added a few more points to the northeast today (Talmey, Tomsett, McNeely),all blue (no geese), maintaining previous patterns. We'll try to fill in a few more during the week to maximize the data set. Hi Hugh, if it's any help I biked past a medium sized flock (a couple hundred birds) at James Gilmore school today about 5pm. They were uncharacteristically quiet, but appeared to be eating happily. You know, if you wanted to you could probably recruit a number of local goose spotters. Just a though. wow, what a bunch of fun & interesting comments to graze through. NICE! Looking forward to whatever conclusions you find. Thanks for the observation. It had occurred to me that the various schools cold be conscripted to keep a "goose log," to contribute to a city wide project about snow goose movements. Next year, maybe. Hopefully by then teachers will be fully back at work. On the topic of geese, there were four greater white fronted geese up in Tera Nova today. There were there both this morning and this evening and I stopped to watch them on my way to and from work.